Newton, NJ – April 16, 2010.Thorlabs, a leading manufacturer of innovative Photonic instruments, is pleased to introduce the S5FC series of Benchtop Superluminescent Diode (SLD) Light Sources. These light sources integrate world class proprietary Indium Phosphide (InP) SLDs manufactured by Covega (now known as Thorlabs Quantum Electronics, TQE) with Thorlabs’ all inclusive benchtop platform. As a result, Thorlabs now offers turnkey broadband SLDs for use in Optical Coherence Tomography (OCT), Imaging Systems, and Fiber Optic Gyroscopes (FOG). Each benchtop is available in 1310 nm and 1550 nm wavelength versions with SM and PM fiber and is equipped with FC/APC bulkhead connectors for easy coupling. Typical power output ranges from 2.5 mW to 30 mW. An intuitive LCD interface enables users to view and set the current and temperature for each fiber-coupled laser independently, a feature that provides high temperature stability. This laser source also includes a USB connection for remote laser adjustment and rear analog inputs to modulate output with an external signal. Each source includes a rear panel interlock, keylock power switch, and independent enable buttons. Users can easily configure the interlock to trigger when doors open, disabling the lasers and providing a key safety feature when operating in high-traffic facilities. To prevent damage, this unit is also equipped with a microcontroller, which will disable the output if input settings exceed laser limits. 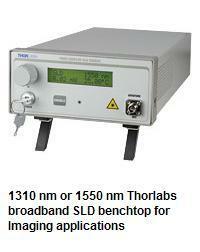 To obtain pricing information, please visit Thorlabs’ Benchtop SLD Light Source or contact Thorlabs’ Technical Support by calling (973) 579–7227 or emailingtechsupport@thorlabs.com. Thorlabs, an active member of the Photonics community for 20 years, manufactures equipment for the photonics industry, including optomechanics, optics, laser diodes, tunable lasers, optical detectors, motion control equipment, and vibration isolation systems. In addition to core photonics equipment, we also provide system-level solutions such as our complete OCT, confocal, and ASOM imaging systems. With offices based in the US, UK, Germany, France, Sweden, Japan, and China, Thorlabs is focused on providing fast response to customer inquiries and same-day shipment for stock items.